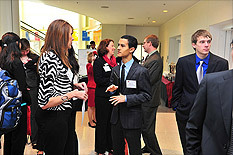 Corporate partners, faculty, and student leaders gathered this January for the University of Maryland Clark School of Engineering’s Corporate Partner Summit. The event offered a special opportunity for Clark School corporate partners, students, and faculty to connect over their shared achievements, goals, and future opportunities. More than 110 people, including corporate representatives from 17 companies, were in attendance. Guest speakers highlighted key initiatives and benefits of membership in the Corporate Partners Program. Chris Carlson, Senior Manager of University Recruiting at Booz Allen Hamilton, discussed recruitment opportunities and the positive experience the company has had working with Clark School students, and Art Morrish, VP and CTO of the Products Group at L-3 Communications noted the company’s strong research relationship with the school. Civil engineering student Craig Lampmann and his concrete canoe teammates received close mentorship from Structural, and Lampmann said the company’s involvement significantly improved the team’s competition performance. Following the luncheon program, student leaders presented posters to showcase clubs, competition teams, and student organizations, many of which are currently supported by corporate partners or may be in the future. View photos from the 2014 Corporate Partner Summit.